While playing on the beach, an unexpected turn of events lead to Rowlet and Popplio getting separated from Ash and the others. The sixteenth episode of the Pokémon Sun and Moon anime is out now, featuring Rowlet, Popplio and Litten! Episode 16 – A Tiny Trio on a Big Adventure!! The episode starts with Ash, Mallow and Lana at the beach. 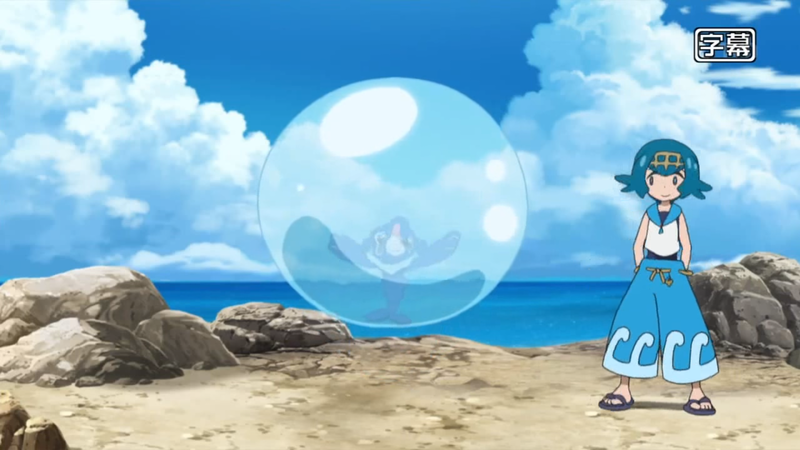 Popplio, as usual, is practicing creating water balloons — only this time, it can get inside them! Ash suggests having his Pokémon go inside the balloon — Pikachu wants to be first! At that moment, Mallow’s Bounsweet sneezes, releasing an aroma that wakes Rowlet. Feeling confused, Rowlet attacks Bounsweet (in the same manner it attacked Ash when he first met the owl Pokémon), causing Bounsweet to defend itself. Rowlet crashes into Popplio’s balloon as it makes it, leading them both to get trapped inside. To make matters worse, the water balloon is blown away by the wind. As Ash, Mallow and Lana search for them, Rowlet, panicked, flails around in the balloon, leading it to pop! 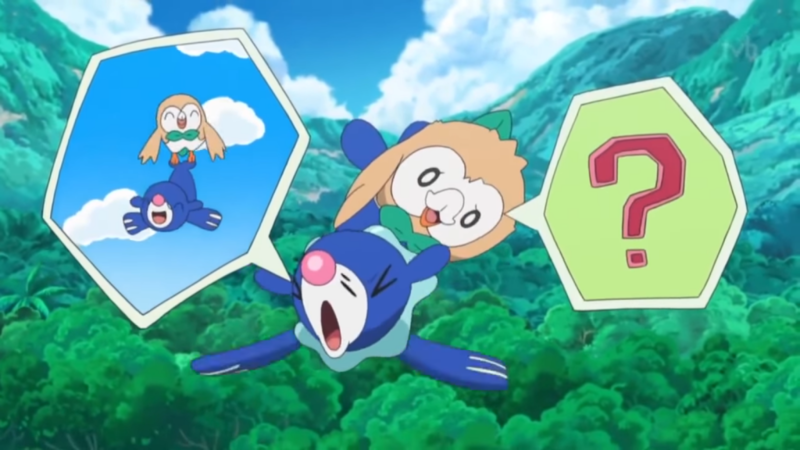 While Popplio is falling, Rowlet manages to catch it but finds Popplio too difficult to carry, causing it to slip and fall again. Rowlet catches it again but this time, as it catches it with its wings, they descend further as Rowlet can no longer fly. Meanwhile, Team Rocket are trying to install a satellite dish and James has to attach a ring for it to work so they can gather information from over all Alola. Popplio and Rowlet then fall right onto Team Rocket, and Rowlet gets trapped in the ring James was about to attach. Team rocket decide to steal them and Mareanie attacks with Spike Cannon, Popplio defends it and gets away with Rowlet. Meanwhile, Ash, Mallow, and Lana split up so they can find them quicker. While Popplio carries Rowlet on its nose and running, Meowth and Mareanie catch up with them. Mareanie is ready to attack but then, an Ember comes out suddenly and hits it. 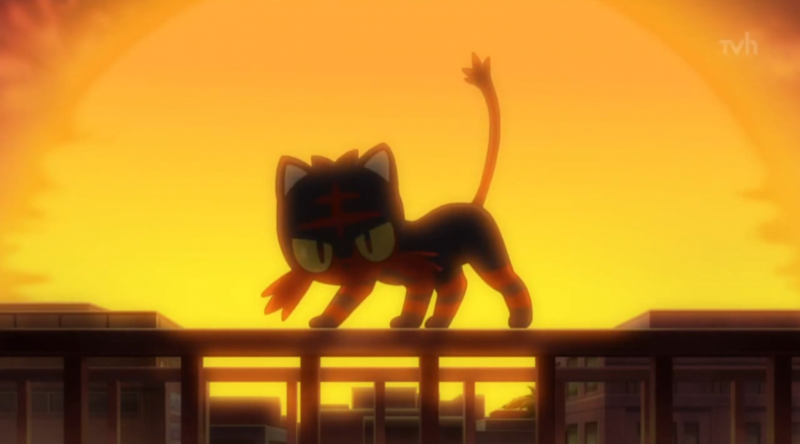 It’s revealed that the attack was Litten’s. 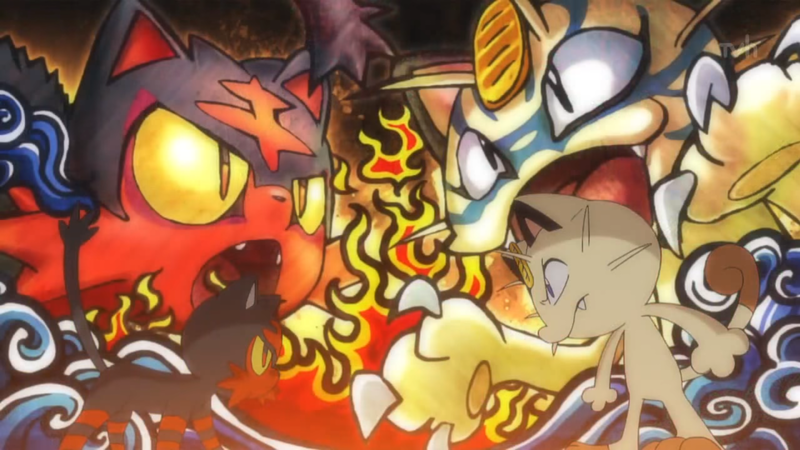 Meowth retaliates with Scratch and Litten does the same, but Litten’s scratch is more powerful and knocks Meowth out. Later, Litten guides Popplio and Rowlet to Stoutland. Ash, Mallow, and Lana continue to search everywhere, asking the people around with no luck. Rotom then tells Ash that Rockruff has a very strong sense of smell, so Ash tells Rockruff to smell his bag because Rowlet always sleeps there. Lana tells it to smell her hands because she always carries Popplio. Using the scents of two Pokémon, they now have leads to finding the lost Pokémon. 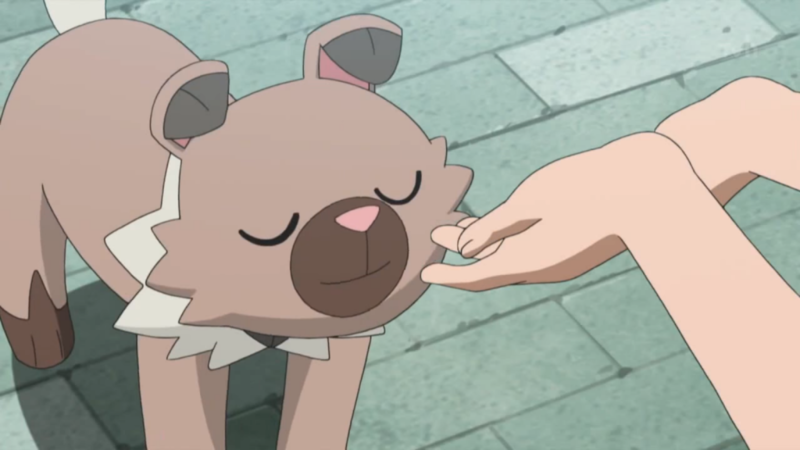 After some time searching, Rockruff catches onto a scent. Meanwhile, as Rowlet, Popplio and Litten are searching, a net falls and captures them. Having them captured, Jessie and James are surprised to see Litten among the other two Pokémon. Team Rocket try to convince Litten to join them, but in an act of refusal, Litten uses Ember on them. Team Rocket begin to remember this Litten as the same Litten who stole their fruit earlier. 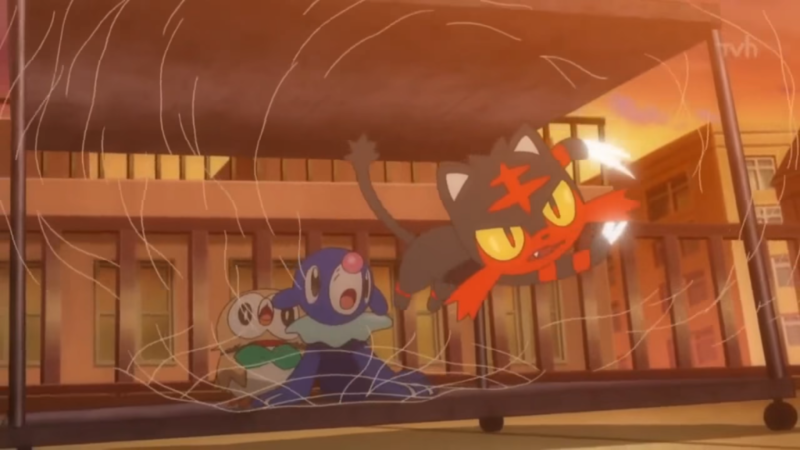 Litten finally agrees to join them and Meowth opens the cage, only for Litten to come out, use Scratch on the net and then allow Popplio to trap Team Rocket in balloons while Rowlet sends them flying with Peck. While in midair, Popplio and Litten continue attacking, and we’re treated to Team Rocket’s first blasting off in the Alola region. Ash, Mallow, and Lana arrive, they’re all so glad to see their Pokémon are fine. Ash sees Litten, thanks it for its help and asks how’s Stoutland. The episode finishes with Team Rocket landing right on Bewear. Previous PostPokéCommunity Daily News Roundup: Week of 3/6/2017Next PostPokéCommunity Discord server turns one!